News & Events What Should We Note When Feeding Double Toggle Jaw Crusher? 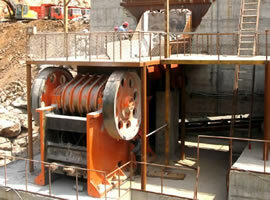 When double toggle jaw crusher is crushing materials, material feeding is the first step. This operation has a direct effect on the subsequent procedures. If the method or time of feeding is not correct, it will cause damages to the crushing parts or give rise to emergency situations during the operation and lead the machine to breakdown. So we should note some details when feeding double toggle jaw crusher in order to avoid incorrect operations. Next, I would like to briefly introduce the feeding requirements of double jaw crusher for everybody. 1. When feeding double toggle jaw crusher, we must observe its running situation after it has been operating for about half an hour. For example, if the machine gives out abnormal noise. And then carry on the crushing operation after everything is going well. Besides, for the first feeding, we should input small gravels or finished materials, by doing this, the double jaw crusher can be likely to get rid of vibration in the initial operation. 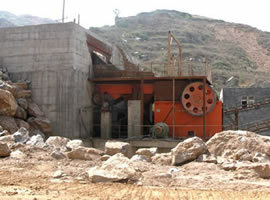 And the materials fed into jaw crusher should be increased little by little, until the full-load running. 2. The particle size of the crushed materials must be strictly conforming to equipment requirements. The materials put into the crushing chamber must be screened in advance. If the feeding materials are not qualified, we should add a set of vibrating screen to the preceding procedures before double toggle jaw crusher, to return the unqualified materials back for a secondary crushing, which is conductive to increasing its throughput capacity and promoting jaw crusher's production efficiency. Because these unqualified materials may fill the slot between the jaw plate edges and shorten the effective length of the edge. If so, the materials between the jaw plates will have to be broken only by pressure and thus the crushing capacity of the jaw plates will reduce and the crushing effect will become poor.